Medical Supplies & Medical Equipment Information: When is safety eye wash used and is there any special training required? When is safety eye wash used and is there any special training required? 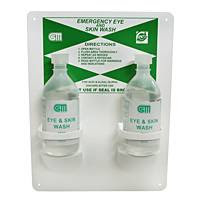 Safety eye wash, either at a station or in a first aid kit, can be used on anyone to flush out chemicals, contaminants, dirt, dust, tiny objects or even larger objects that are in the eye but not embedded in the eye. The safety eye wash is easy to use either on yourself or someone else and just requires that the eyelids be opened and the solution applied liberally to the eye. The excess fluid then rinses the eye, allowing the debris or contaminant to be flushed out. No special training is required to use safety eye wash and many of the bottles have a special cup that actually holds the eyelids open for easy application of the specialized eye wash solution. What is the difference between an eye care kit and a safety eye wash station? Often at a safety eye wash station all the elements of an eye care kit can and will be found. Generally a safety eye wash station is designed to allow the eye to be flushed out, not necessarily to provide any type of extensive first aid support. Since many types of situations will require additional attention besides just being flushed out, eye care kits are often found at the station. Eye care kits contain the basic first aid needs for most of the common eye injuries. These extra supplies include cold compresses and packs to help alleviate pain and swelling, eye pads to cover the eye and provide protection, eye cups to completely shield the eye after the pad has been applied and tape to secure the cover. Are there any products for people that wear glasses in the workplace? Stations are available that are designed to help those wearing glasses in any type of workplace situation. They are mounted on the wall and are made of durable plastic, ideal for any industrial type of situation. The tissues are treated with a special anti-fog and anti-static solution, allowing for quick cleaning of lenses as well as clear vision even in humid conditions. What is the best type of box to hold safety eye wash stations or kits? The best option for turning a safety eye wash station into a very durable and long lasting kit is to house it in a polypropylene box. This type of plastic is both durable and mold resistant and, provided the box has a seal, it will be water resistant under normal conditions. The seal will help to keep humidity and moisture out of the box, eliminating any chance of damaging gauze, bandages, tape or eye pads that may be kept with the safety eye wash. A box also provides the option to easily transport the kit in the event of an accident or emergency. Of course it can also be mounted to the wall or kept with the first aid kit in a designated first aid cupboard or room, depending on the specific workplace location.